Dubbed the ‘Coolest Car Park in Cardiff’, the Pierhead Street multi-storey car park in Cardiff Bay formed part of the £150m Cardiff Waterside commercial development. The 21st Century design represents the rich nautical heritage of Cardiff Bay. Here Technical Director, Barry Clarke explains how the stunning dramatic light wave effect on its façade was structurally created. The car park is essentially a simple rectangular structure, 98m long and 20m high. The local geography makes it a prominent landmark within Cardiff Bay, visible over distances from the city of Cardiff itself. As such, it provided a unique opportunity for an iconic statement in support of the Cardiff Bay development, not something that you would think would naturally occur with such a mundane building form. 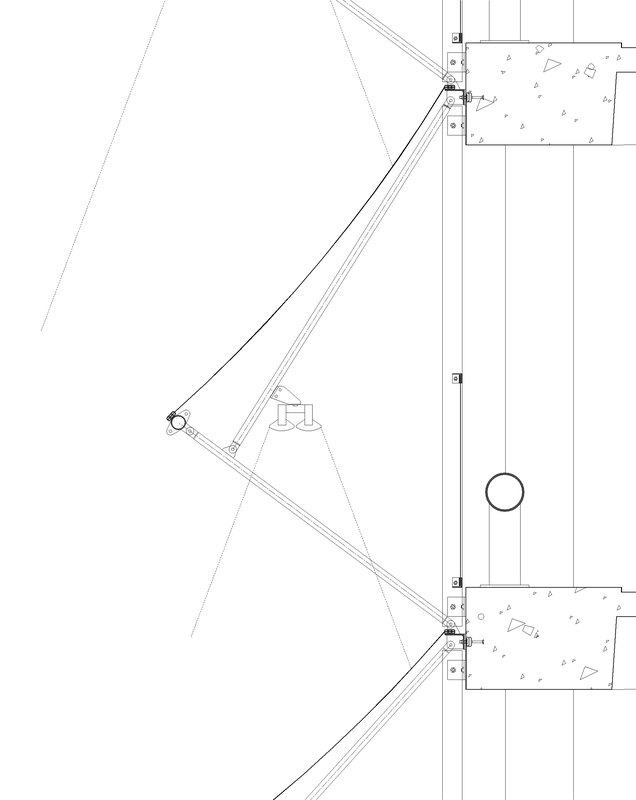 To this end, a sense of movement and visual interest was called for, to the north elevation of the structure. The nature of Cardiff Bay suggests waves rolling onto a coastal beach, however wave shapes have become somewhat cliché for coastal developments. The design concept developed therefore was for a rolling wave structure, progressing along the façade of the building, with dynamic lighting to enhance the sense of movement:- not so much what a wave looks like, more what a wave is. 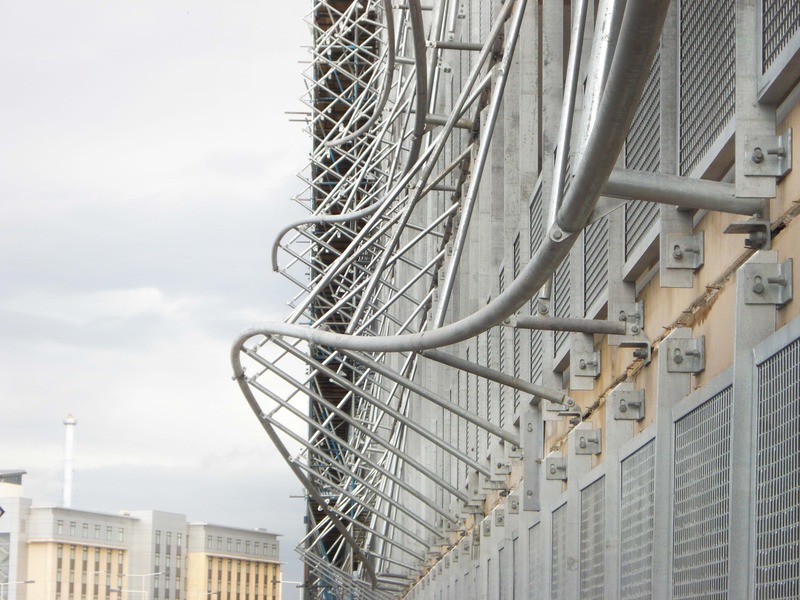 The wave structure is created by tensioning a coated mesh fabric over an undulating steel framework, running along each parking level. These waves are layered up the elevation, creating a flowing surface along the length of the Façade. The impression of movement this gives is enhanced by the use of a rich blue light, washing down onto the face of the individual wave structures. By varying the intensity of the light imposed onto each bay over time through programmable control gear, a peak of the blue light can be made to travel along the undulating façade giving the impression of a moving, rolling wave. 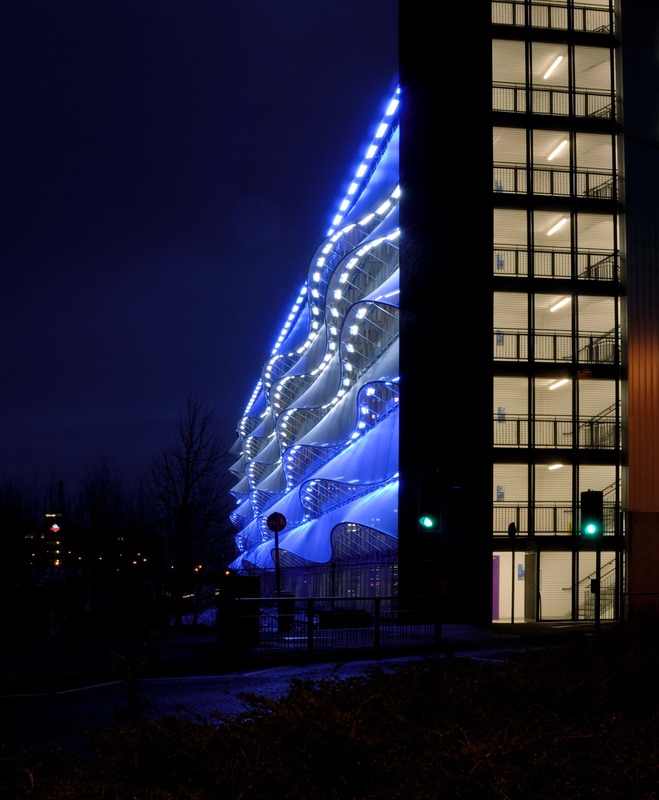 By varying this effect from one level of wave structure to another, the entire façade offers an ever changing, moving and gently glowing “beacon” on the skyline of Cardiff Bay. The length of the façade is broken up into a number of repeating bays. Each bay has a curtain of the white polymer coated high-tenacity polyester micro-yarn mesh fabric hanging down from the slab edge above, tensioned into a part of the wave form by a shaped tubular steel frame projecting from the slab edge below in a gentle arc. This is propped away from the building by diagonally raking tension rods hanging from the slab edge above, keeping the structure rigid enough to tension the mesh fabric. Varying the length of the tension rods for a particular bay tilts the arc, raising the “hem” of the wave, and varying it’s projection along the façade. This is used to create the impression of a single continuous natural wave-form along the building. By changing the degree and location of the variations from one level of the façade to another, the whole façade is given an organic undulating feel. Independently controlled twin lamps in a single light fitting are suspended from the raking struts in each bay, to wash the level below with a varying intensity of blue light.